A zoo of parasitic worms can be found in chicken flocks. Worms find cozy places to stay in the crop, gizzard, intestine, cecum, windpipe, and even the eyelids. The eggs and immature stages of many parasitic worms can live outside of the chicken host for a long time, possibly several years. Some parasitic worms spend part of their lifecycle in other creatures, such as earthworms, insects, slugs, or snails. Chickens pick up worms by eating dirt or litter contaminated with worm eggs or by eating small creatures carrying immature stages of worms. Cecal worms, also called heterakis worms, reside in the ceca of chickens. They’re very common and generally don’t do much harm. The main worry with cecal worms is their ability to carry blackhead parasites, which are deadly for turkeys but rarely cause disease in chickens. Eyeworms (Oxyspirura mansoni) cause trouble only in warm climates, such as the southeastern United States, where the particular cockroach host lives. The parasite burrows under the third eyelid of chickens and other birds, causing eye to swell shut. As you can imagine, it’s irritating, and the bird does additional damage by scratching at the eye. Syngamus trachea, the gapeworm, attaches to the lining of the windpipe in chickens and other poultry. If enough gapeworms get together in the windpipe, they cause a disease known as the gapes, named for the open-mouthed, distressed breathing of affected chickens. Young birds are more likely than older birds to have heavy infestations of gapeworms and get the gapes, which can be fatal. 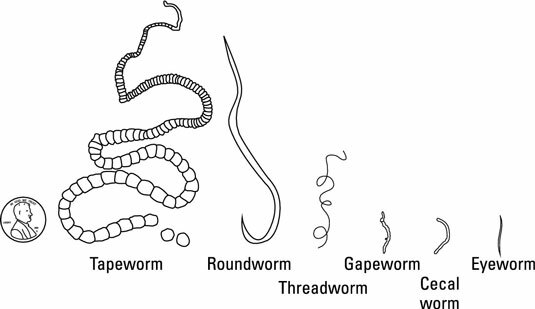 Roundworms (Ascaridia galli) are by far the most common parasitic worm of chickens. Young chickens with heavy infections of these big intestinal worms get skinny despite a good appetite. Chickens older than 4 months develop resistance to roundworms; the mature chicken’s immune system kicks out most of the bums. Every once in a while a roundworm will crawl into a hen’s oviduct and wind up inside an egg that she lays. This isn’t a human health hazard; it’s just disgusting. Long ribbon-shaped tapeworms live in chickens’ intestines, where they don’t eat much or (usually) do much damage. In large numbers, tapeworms can cause birds to be skinny, but they’re rarely fatal. Some Capillaria, or threadworms, hang out in the crop or esophagus; others prefer to live in the intestinal lining. Heavy infections cause droopiness, pale combs, weight loss, and sometimes death. You can’t completely eradicate parasitic worms, so the goal is to knock down their numbers by deworming so they do no harm to their hosts. To deworm your chickens means you give a medication that is effective at killing or paralyzing intestinal worms. The dead or dying worms pass out of the chicken’s intestines in the droppings. Be careful about deworming too much. Repeated deworming only leads to worms developing resistance to medications. Good evidence actually suggests that hosting a few worms is an immune system booster, believe it or not! Albendazole, fenbendazole, ivermectin, and levamisole are effective treatments for most parasitic worms of chickens. Fenbendazole and albendazole have the advantage of being extremely safe medications. Piperazine is only effective against roundworms. In the United States, legal use of any dewormer medications for chickens (except for piperazine in non-laying chickens) requires a prescription from a veterinarian. Talk to your veterinarian about timing of treatment and egg discard times. There is not an effective herbal or mineral remedy for chicken worms. Tobacco is far too toxic. Extensive research on diatomaceous earth (DE) has had very disappointing results; the substance has little if any effect against internal parasites. The dried leaves of Artemisia herbs (wormwood and sweet Annie) seem promising. Give the birds plenty of room. Avoid overcrowding. Try not to introduce wormy chickens to the flock. Get your chicks as day-olds or deworm older birds before letting them meet your flock. Remove (cull) birds with repeated parasite problems. Some animals are just inclined to being wormy (it may be a genetic predisposition). Those few chronically wormy individuals are responsible for most of the worm burden in the flock and most of the contamination of the environment with worm eggs. Rotate and rest pastures for pastured poultry. Periodically move the chickens to different ground, and leave the old site empty of birds for several months or years, if possible. Keep wild birds away from the flock. They may be infected and shedding worm eggs in their droppings. Keep chickens off freshly tilled ground. Doing so greatly reduces the amount of feasting on the banquet of turned-up earthworms and insects. Use integrated pest management (IPM) practices to control insect populations. Integrated pest management is an environmentally sensitive approach to pest management that relies on a combination of common-sense practices, such as rotating pastures and using mechanical trapping devices before resorting to broad-spectrum chemical pesticides. For more about using IPM for your flock in the United States, contact your local extension office.